here is a great collection of video taken during the 2011 Sunfish Worlds down in Curacao. 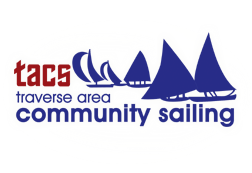 the whole video is about 22 minutes long, with a ton of video coverage out on the water during the Sunfish racing, as well as some video shots from the beach during the setup, and a few short interviews with sailors (not always in English, though). the video gets really exciting at about 9 minutes in – the video below should start right there – and continues for about 5 or 6 minutes. the wind must have been really strong, and the waves were really big, and you can see the Sunfish sailboats cresting up and over the wave peak, and riding the wave down into the trough, at times seeming to swallow up almost the whole Sunfish and sailor. there is also an short 30-second interview (direct link) with the 2011 Sunfish Worlds champion, Matheus Dellagnelo. and a slideshow of photos at the end of the video, but for photos… you’re better off just browsing the hundreds of photos at the Sunfish Worlds 2011 Flickr stream. this video was posted up at SunfishWorlds2011.com – it is the view from the signal boat during last minute leading up to the start of the final race at this year’s Sunfish Worlds Championship in Curacao. you can hear the strong winds blowing past the video camera, and see how the signal boat is rolling up and down with the waves out on the water. certainly some challenging conditions for the sailors to battle through. 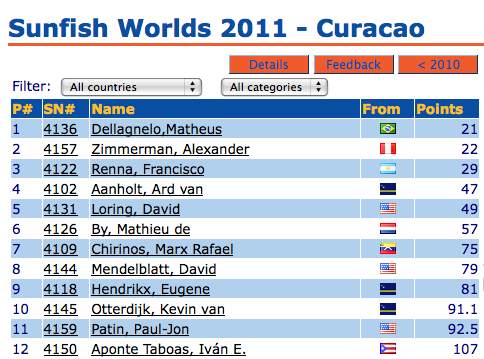 sunfish worlds 2011: Matheus is the champion! ahead by 6 points going into the final day of racing at the 2011 Sunfish Worlds, Matheus Dellagnelo of Brazil held nothing back, as he went to sail for 1st place finishes in the first 2 races of the day, which mathematically gave him the crown without even having to sail in the 11th and final race. Matheus sailed with amazing consistency and finished with (3) 1st places, (3) 2nd places, (2) 3rd places, (1) 6th place, and (2) discards, including the DNC in the final race to finish with 21 points total, just enough to stay 1 point ahead of 2nd place Alexander Zimmerman of Peru, who won the final race. behind him in 3rd place was Francisco Renna of Argentina, and Ard van Aanholt of the host country Curacao finished in 4th place. David Loring of the USA, a 3-time Sunfish World Champion (recently in 2009), finished in 5th place. the full results can be found here. I’m sure this evening is busy with the festivities and the awards ceremony will be tomorrow night, so I’m sure that SunfishWorlds2011.com will have more updates in the next day or two. as usual, stop by and check out the hundreds of incredible photographs taken in Curacao, during the racing and on the beach areas. some of the day 3 racing was delayed due to rain, but they were able to get in 2 races. Matheus Dellagnelo of Brazil maintains his hold of first place overall, finishing day 3 with a 3rd place and 2nd place finish. Alexander Zimmerman of Peru with a 1st place and 4th place today moves up a spot to 2nd place overall. Ard van Aanholt of the host country Curacao dropped one spot to 4th place overall, as he finished with a 9th and 10th today, allowing Francisco Renna of Argentina to move up 1 spot to 3rd place overall. some of the photos from day 3 racing and the Annabaai parade have been uploaded (I would imagine more are in process). the buildings are so colorful along the waterline! 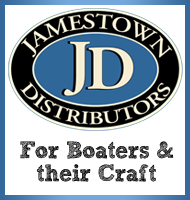 here is a video of a parade on the water in Annabaai today, with 70 Sunfish sailboats participating! tomorrow is a day of rest, with racing to be concluded with up to 3 races on Friday, and the Awards Ceremony on Saturday. a day 3 recap from Luis Horacio Canuto of Argentina can be found at the Dingo Sailing Blog (here is an English translation). and there are now pictures of racing from day 2 that have been uploaded to the Flickr photostream. the pictures aren’t all tagged, but photo credits should go to Bea Moedt, Marianne Lenos, Ltz Duin and Kurt Peterson. after day 2 of the Sunfish Worlds 2011, there is a shuffling at the leaderboard, with Matheus Dellagnelo of Brazil taking hold of first place overall with (2) 2nd place races on day 2. Ard van Aanholt of the host country Curacao is currently holding onto 2nd place overall, only 3 points behind the leader. the 1st race of day 2 was won by Alexander Zimmerman of Peru, who currently sits in 3rd place. the final 2 races of day 2 were both won by Francisco Renna of Argentina, moving him up into 4th place. there aren’t as many photos posted today (yet?) of the racing, but still several shots from the beach of the Sunfish racing or coming back into shore, and there are some close-up shots of some of the sailors. see the full set at Flickr here. a day 1 recap from Luis Horacio Canuto of Argentina can be found at the Dingo Sailing Blog (here is an English translation). also, stop on over at Regatta-Fanatic, to get a recap of the Sunfish Youth Worlds from Rhône Findlay of St Maarten, who finished the Sunfish Youth Worlds in 16th place, sailing in a boat that was mostly unfamiliar to him! Paul-Jon Patin from the USA, also of StarboardPassage.com, currently in (provisional) 4th place after 5 races at the Sunfish Worlds 2011, has uploaded a sweet video with excerpts from a run and the second beat during his practice race before the Sunfish Worlds. 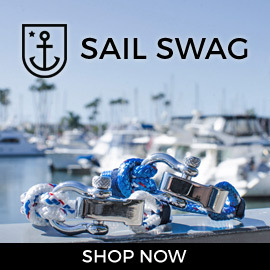 it gives you a nice taste of the crazy wind and waves that these sailors are dealing with down in Curacao. day 1 of the 2011 Sunfish Worlds is in the books, with 3 races completed this afternoon. the current leader is a familiar face, David Loring of the USA, who has won the Sunfish Worlds three times already, with his latest win in 2009. he holds a 3.5 point lead over Jon-Paul Patin of the USA, also a previous Sunfish Worlds winner (1992). [you can see a full list of previous Worlds champions here.] the host country Curacao has 3 sailors currently in the top 10, led by Ard van Aanholt in 4th place, and Curacao has 9 sailors in the top 30. Jean Paul de Trazegnies from Peru, the winner of the 2011 Sunfish Youth Worlds a few days ago, is currently in 13th place. as usual, there are some amazing photos of the sailing action out on the water, although apparently Bea Moedt is having some issues with the camera and water not getting along! but you could have fooled me – these photos are fantastic, and it looks like amazing, and maybe a little bit crazy conditions out on the water. Laser Performance (@LaserPerform) has also posted several pictures from today on Facebook. also, Gerard with Sunfishworlds2011.com posted some aerial photos that the Coast Guard shared with them – you can find several pictures at this Flickr folder.